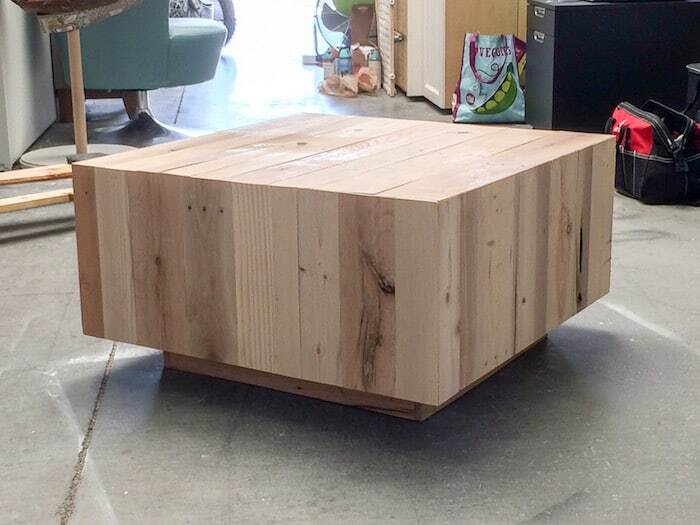 This DIY coffee table was inspired by a West Elm find for $999 – except we made our version for less than $50 using pallet wood. It’s easy to do! Sometimes you see a piece of furniture in a catalog you HAVE to have. You know what I’m talking about, right? 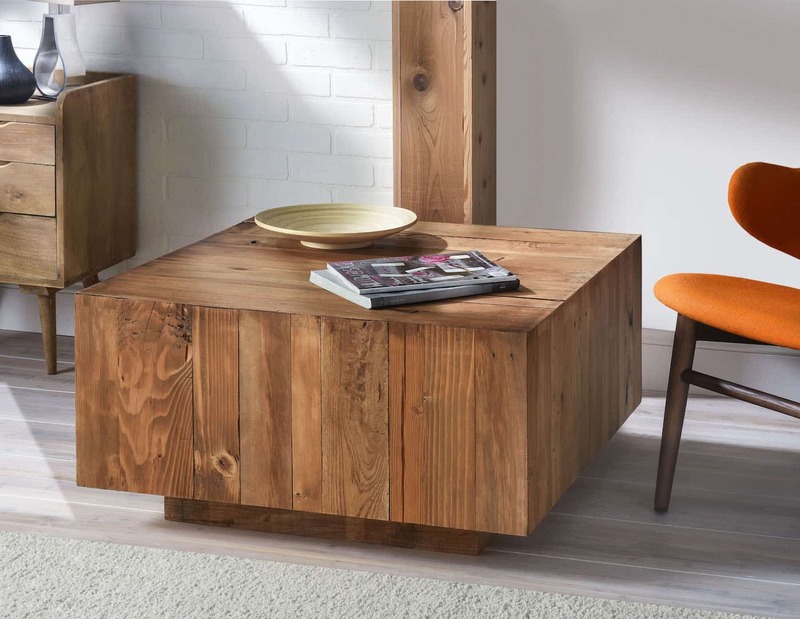 For us it was a West Elm Plank Coffee Table, with the price tag of $999. 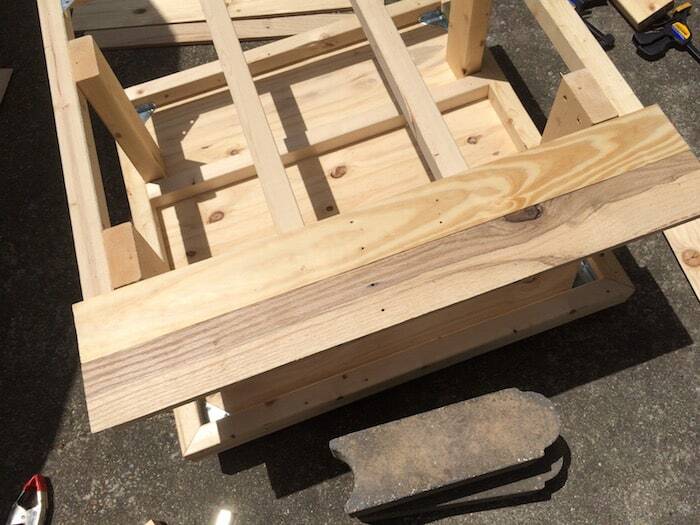 But then we realized something – we could make our own DIY coffee table, for a lot less, out of pallet wood. We’ve worked with pallet wood before, but this was the biggest project we decided to tackle with it. The good news? It wasn’t as hard as we thought . 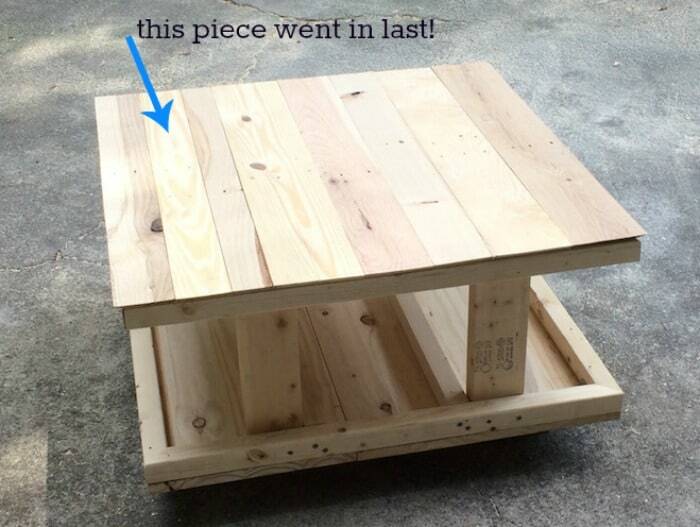 . . and this DIY coffee table ended up being less than $50 to make! $45 total. Find it here listed for $999. We weren’t about to be intimidated by a table and we knew we could make a DIY coffee table ourselves! Here’s how we made ours. The finished dimensions of this table are 16″ tall x 30″ wide (square). Cut List – you can download the entire cut list HERE or each page separately: Cut List 1, Cut List 2, Cut List 3. I highly recommend downloading the cut lists and printing to follow along with the instructions. The cut list will help you purchase the right amount of wood assuming you don’t buy the same lengths as listed in the Supplies above. 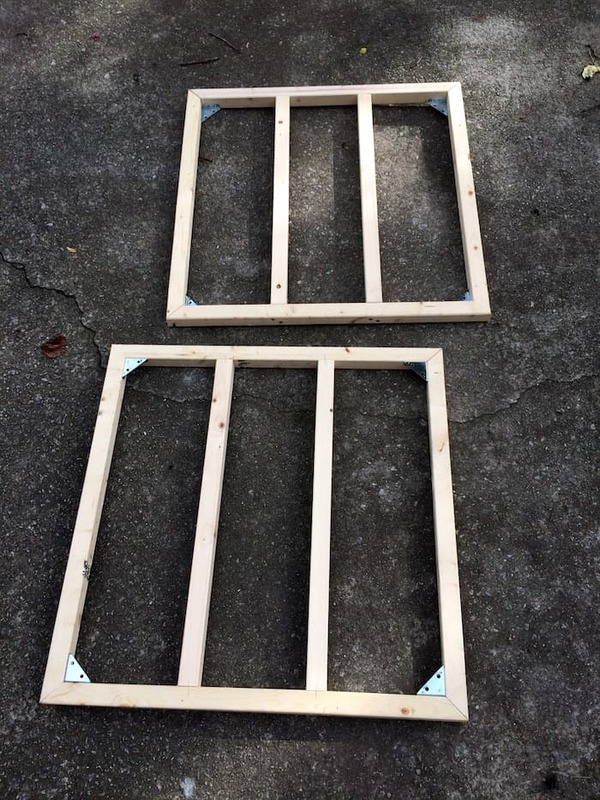 Step One: Grab your 2 x 2s and trim them down to 30″ pieces. 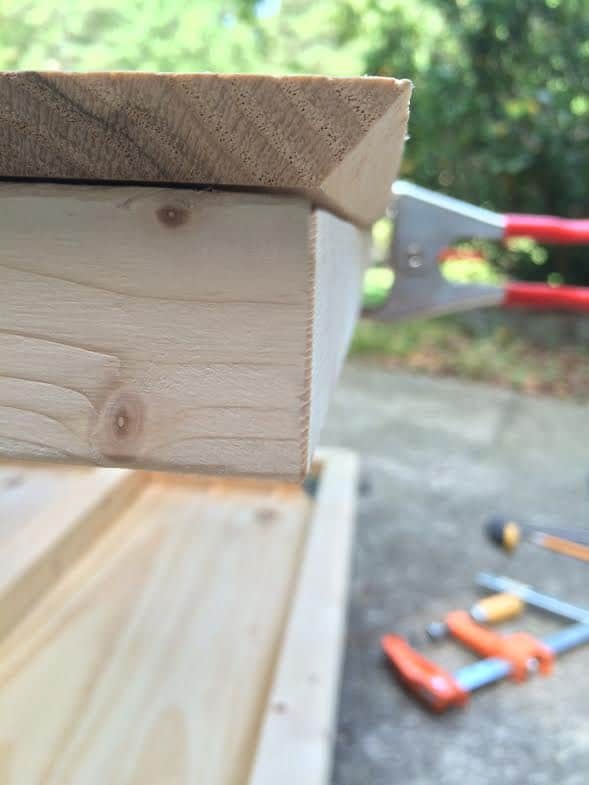 Make 45º cuts at each end using the miter saw (see Fig. 1 on the Cut List). 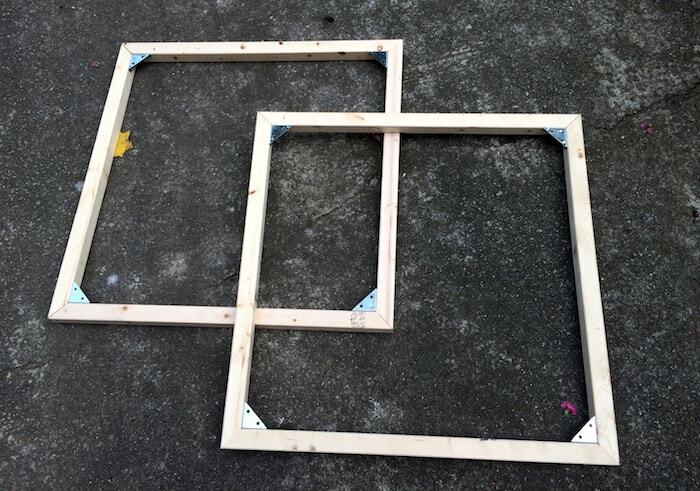 Step Two: Use the corner braces with your drill to join the 2 x 2s into two frames. 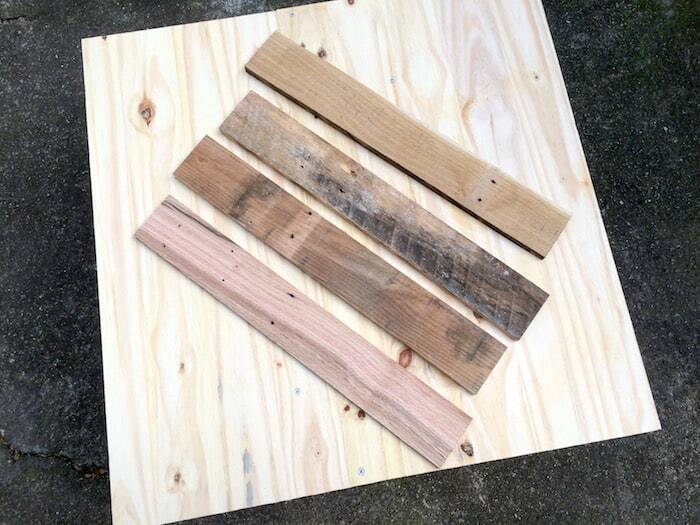 Step Three: Cut down the remaining 2 x 2 wood into 27″ long pieces (see Fig. 3 on the Cut List). You’re going to add two cross pieces to each frame. Use your tape measure to add them at 10″ and 20″ – so equidistant across the frame on the top and bottom. 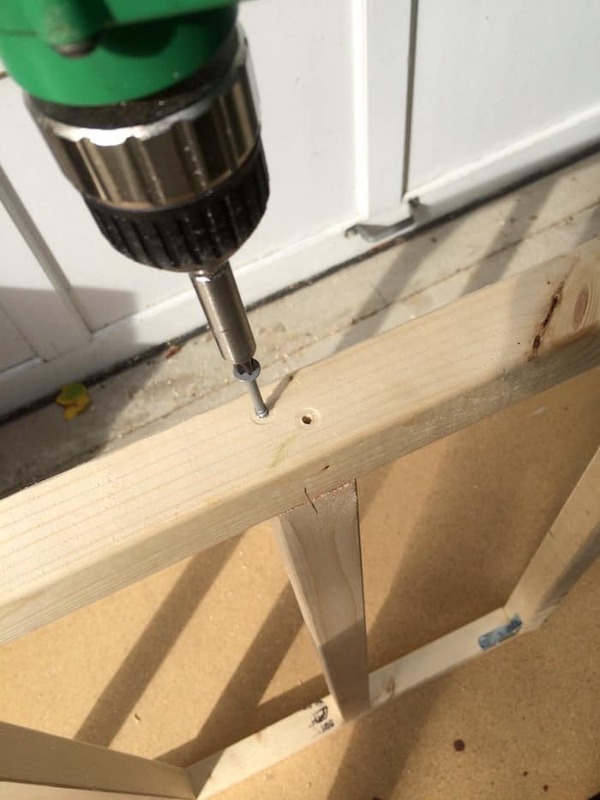 Mark with a pencil, drill two pilot holes, and then screw in 2 1/2″ wood screws. Step Four: Cut your plywood down to 30″ x 30″ using a table saw (or a circular saw – anything you can cut a straight line with, see Fig. 4 on the Cut List). 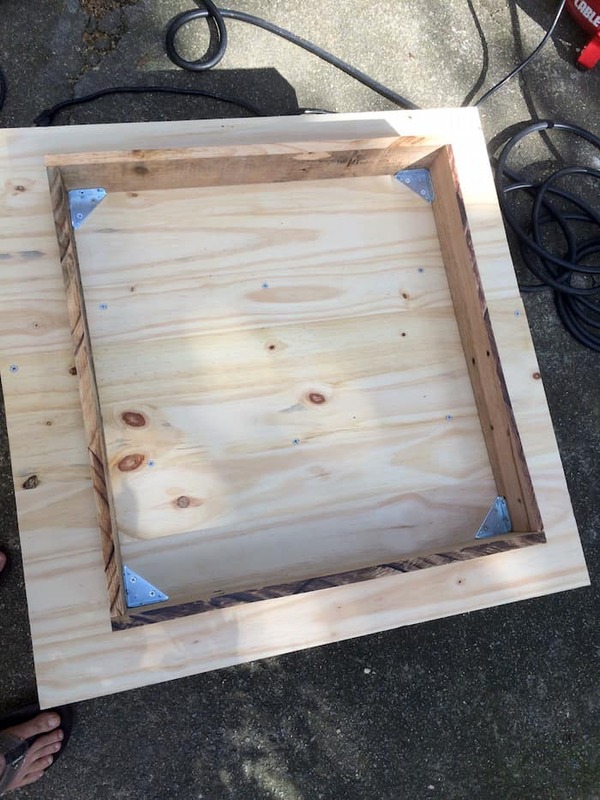 Attach one of the frames to the plywood (it doesn’t matter which one you pick) using the bottom sides of the corner brackets and your drill. The plywood piece is going to sit on the base of your table, which you’ll make shortly. 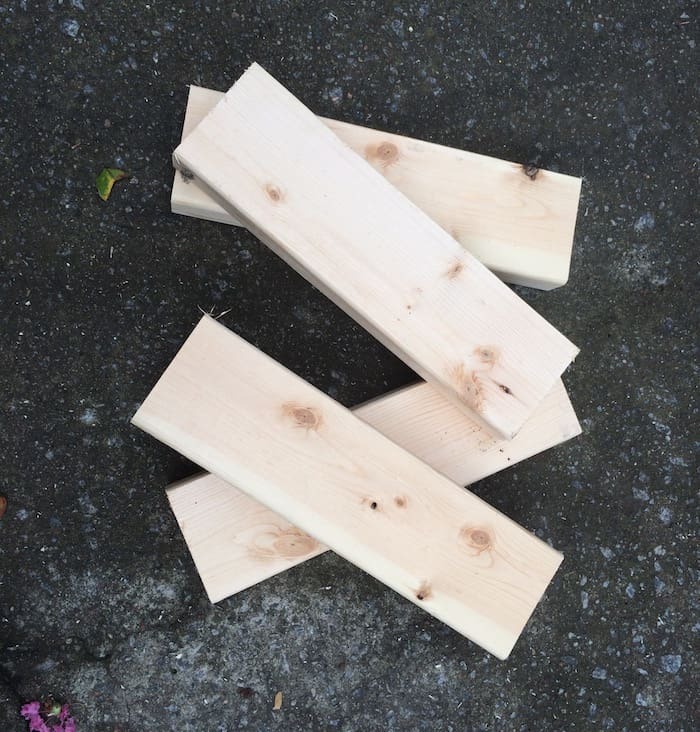 Step Five: Cut your 2 x 4 into four 12″ pieces (see Fig. 2 on the Cut List). 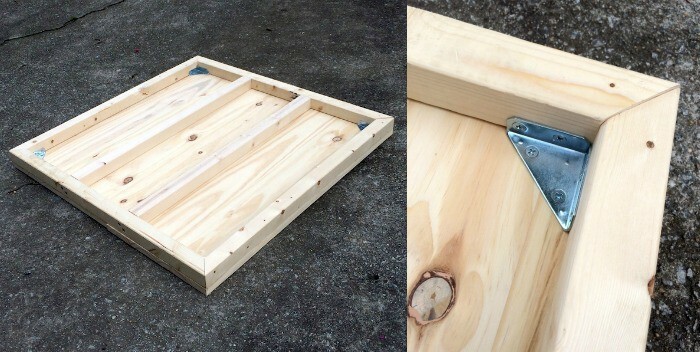 Attach the four 12″ pieces as shown in the photo using wood screws and a drill. 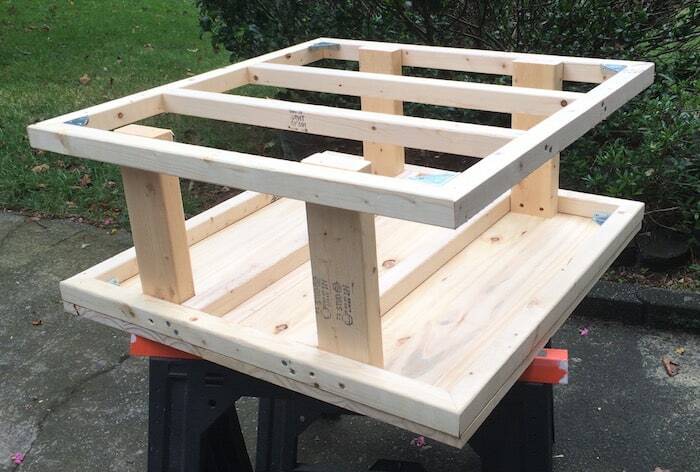 Notice that the slats on your 30″ top frame are not parallel to the frame on the bottom with the plywood attached. This is on purpose to add some rigidity to the piece. Step Six: turn the table skeleton over so the plywood base is facing up. 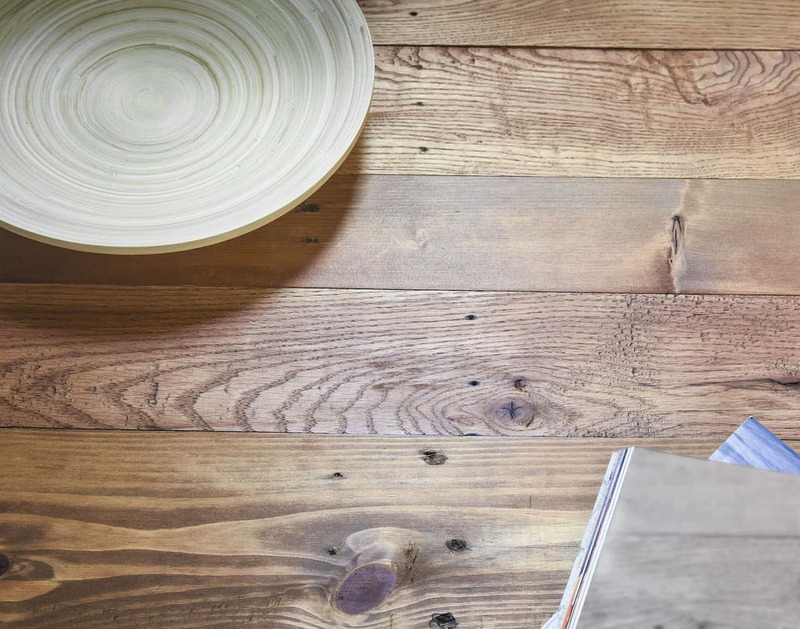 You’ll want to have four pieces of pallet wood cut to 3.5″ wide by 22″ long (see Fig. 5 on the Cut List). We used a table saw to cut the length and the miter saw to quickly cut the ends. Use whatever saw works best for you. 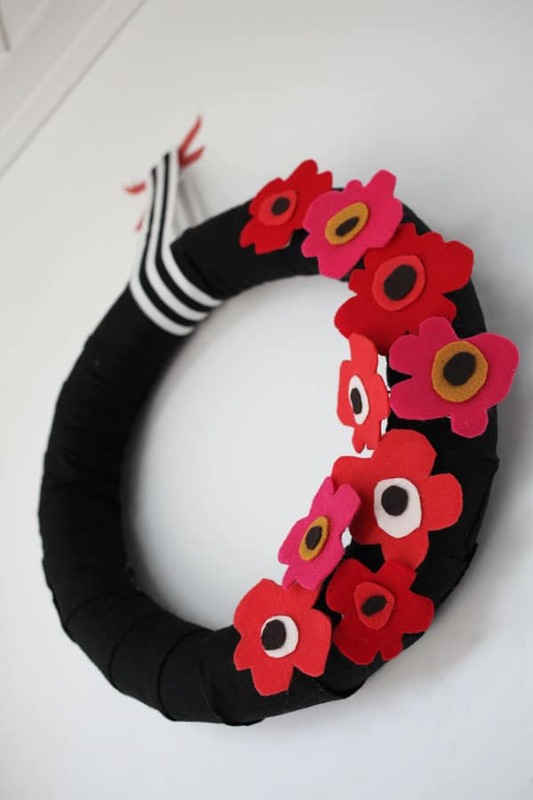 Form your base by making a frame out of the four 12″ pieces. Put wood glue on the end of each board, attach to another board as shown, then nail the ends with the nail gun (see the photo above, left). 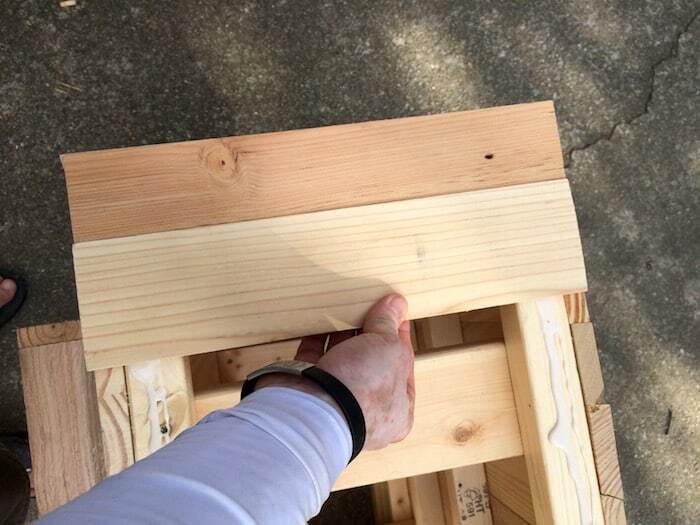 Use your remaining corner brackets to add the base to the bottom of the plywood – use your measuring tape to center the base. 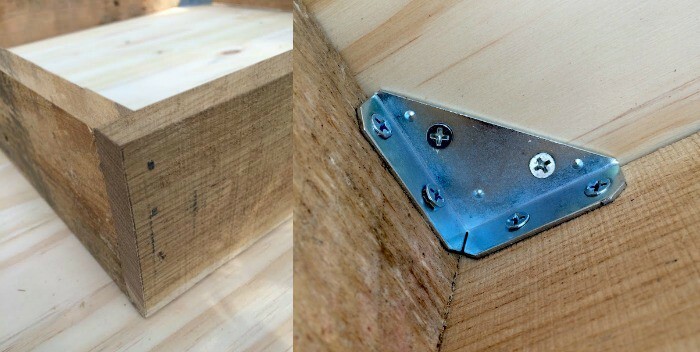 Then add about eight additional 1″ wood screws to attach the plywood to the frame. Add them in the middle, randomly. This is how the base looks when it’s done. You can flip the table back over. Step Seven: Pay close attention as I explain the next part. You now have a skeleton frame of a table, with a base. The next step is to cover the top, then in the following step you’ll cover the sides. Our table top has two end pieces (shown as Fig. 7 and Fig. 8 on the Cut List) and SIX pieces in between (shown as Fig. 6 on the Cut List) of varying widths. You may or may not have six middle pieces depending on a variety of factors (like how big you decided to make your table or how wide the pieces were to begin with). 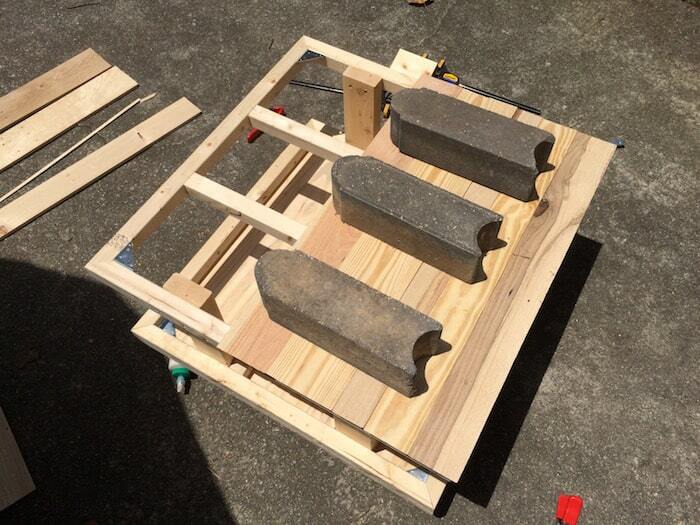 The two end pieces need 45º angles down three sides – two short sides and one long side – cut with a table saw. 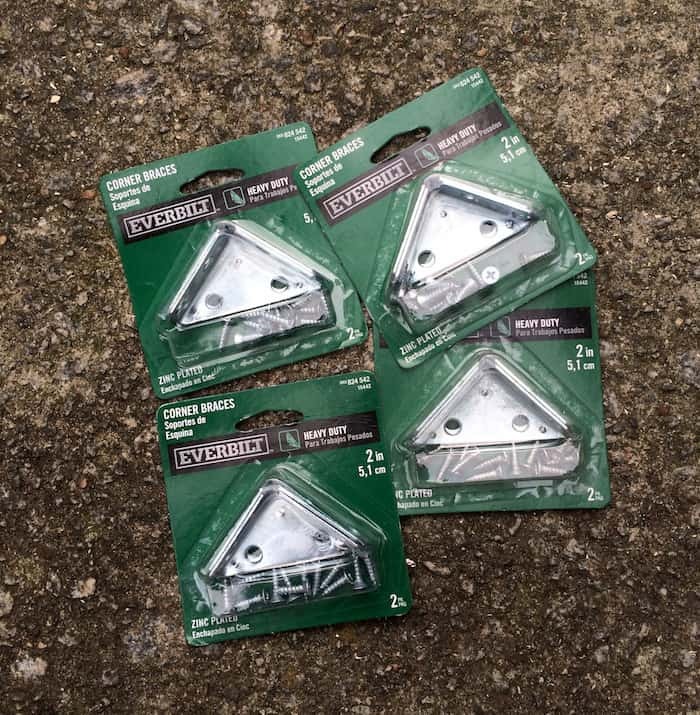 The middle pieces need 45º angles on each end. Steve cut and glued as he went along. He started at one end. 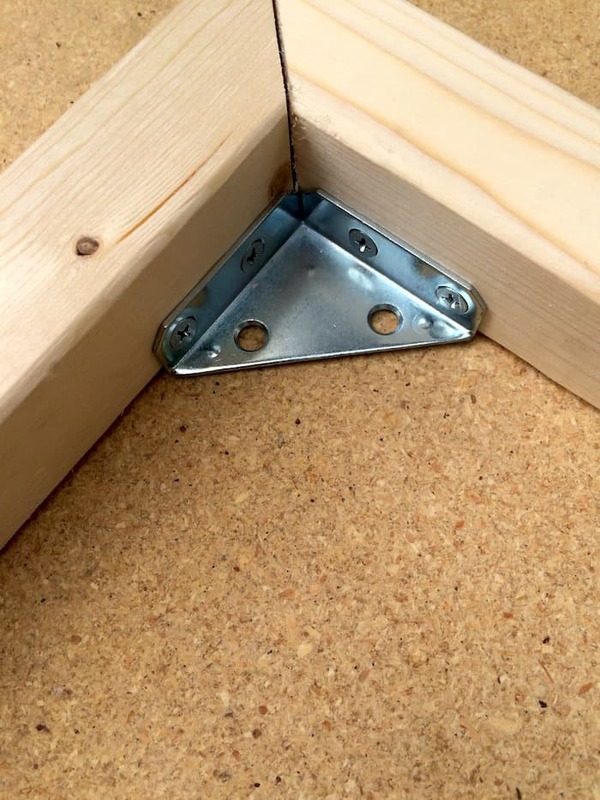 He cut the end piece using his table saw (with the 30″ length and the 45º angle), then glued it down with wood glue and clamped it into place. 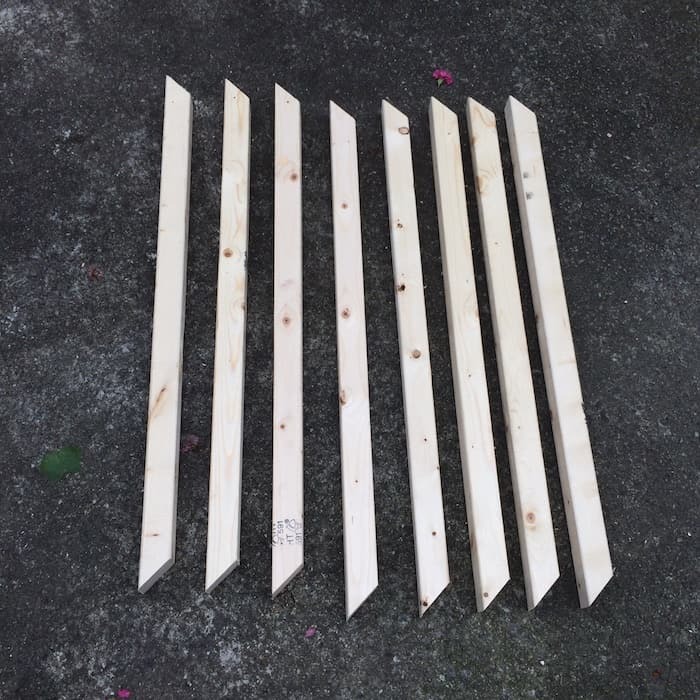 Then he cut a second pallet board – 30″ long, 45º angles on both ends, glued into place. You don’t need to clamp the second board, just put it in tightly. Steve varied the width of the pallet boards using the table saw as he went along. You can cut and glue as you go, or you can cut all of the pieces and lay them out first. That’s your choice. Steve continued cutting and gluing, but not all the way to the end. Once he got close to the end, he did the end piece first, THEN went back and cut the last piece to fit in the remaining gap with his table saw. Once the table top is done, let it dry for a few hours. Step Eight: Time for the sides! You’re going to approach the sides the same way you did the top. The differences: the side pieces are shorter (12.5″ long), the end pieces need two sides with 45º angles (instead of three), and the middle pieces only need one short end with a 45º angle instead of both (see Figs. 9 and 10 on the Cut List). Repeat with the other three sides – leaving a couple hours of drying time between sides. Pretty soon, you’ll have a finished table! You can leave it as is, or you can do a light sanding with 120 grit. We chose to do a light sanding before staining. Wipe away any sanding dust, of course! 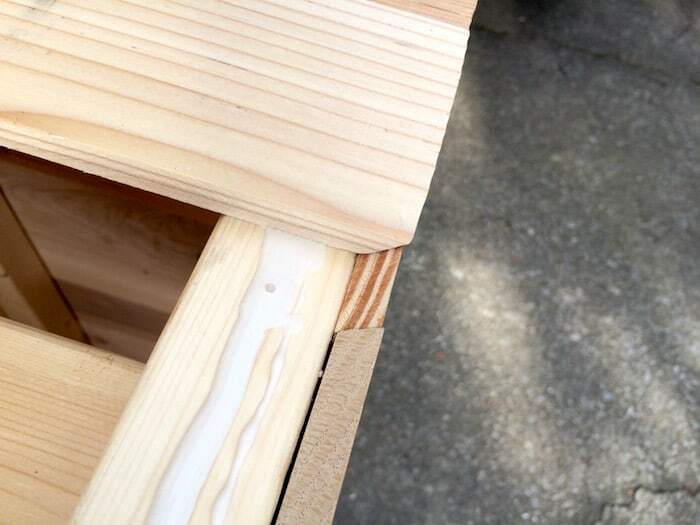 You might be asking if the wood glue is enough to hold all four sides and the top on – the answer is yes. We’ve done a lot of sitting and dancing on the table (you think I’m kidding) and it’s really sturdy. You’re in the home stretch! The last step was to stain and wax the table. We picked FolkArt Home Decor Wax in Antiquing – for several reasons. It’s non-toxic, we liked the color, and it also provides a really smooth finish to the touch because it’s a wax and stain in one. Just glop it on as shown, then rub in with a cloth. Work about 1/3 of the table top at a time, then the sides, then the base. Don’t leave the wax on for too long before wiping away with the rag because it will soak in. 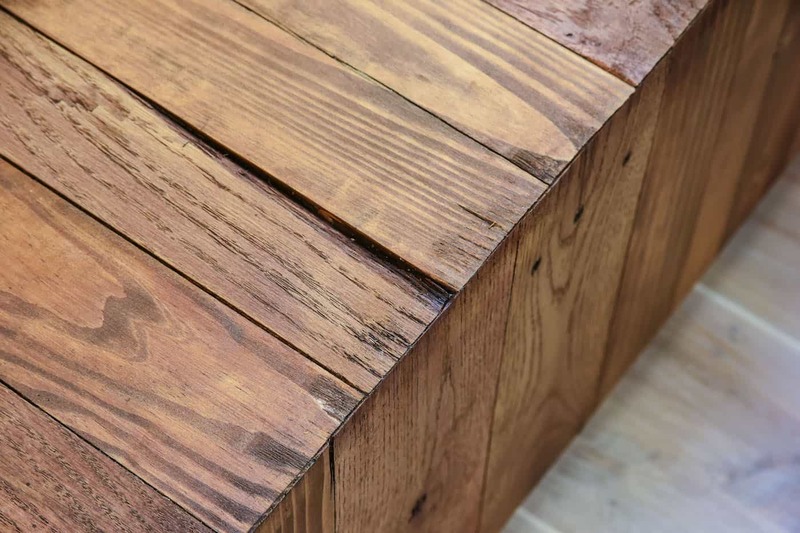 It’s really amazing how the stain soaks into the pallet wood on our DIY coffee table and gives a beautiful finish . . . with gorgeous variations in color. 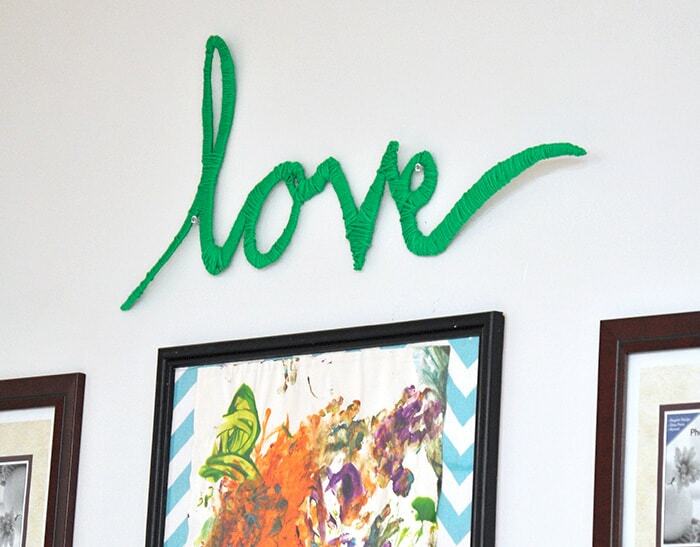 The nail holes and knots add character as well. 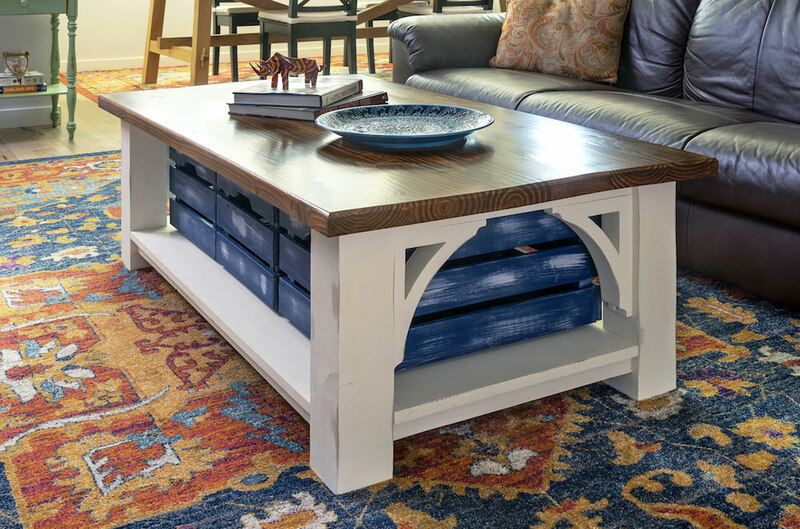 Take a look at the details – we’re so happy with how our DIY coffee table turned out! 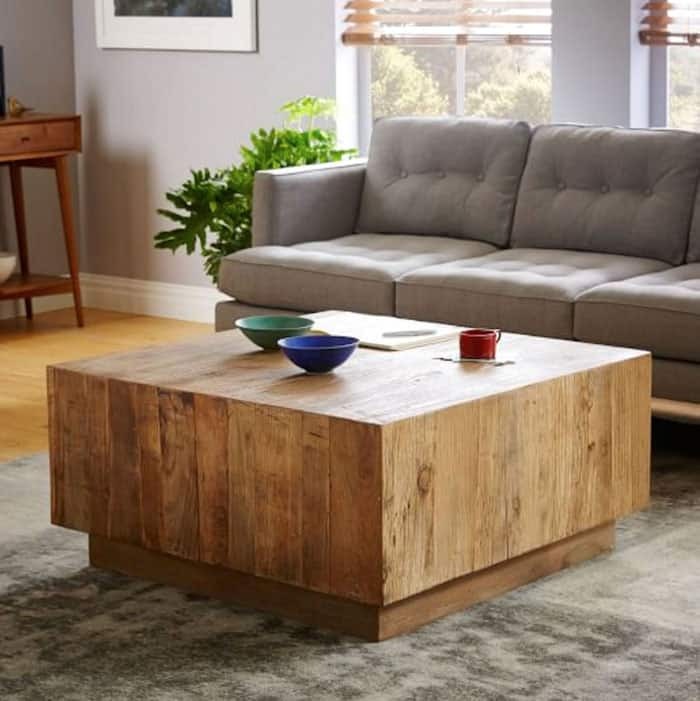 Our West Elm inspired DIY coffee table is one of our favorite furniture pieces of all time! AND as I mentioned, total cost of $45 . . . a huge savings over $999. The pallet wood helped with the cost and also helped with the character. 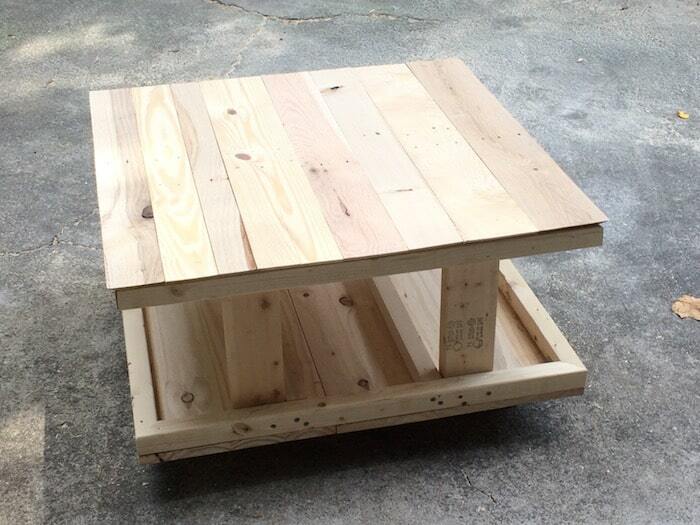 If you want to make something with pallets but aren’t sure where to find them or where to start, check out this article. 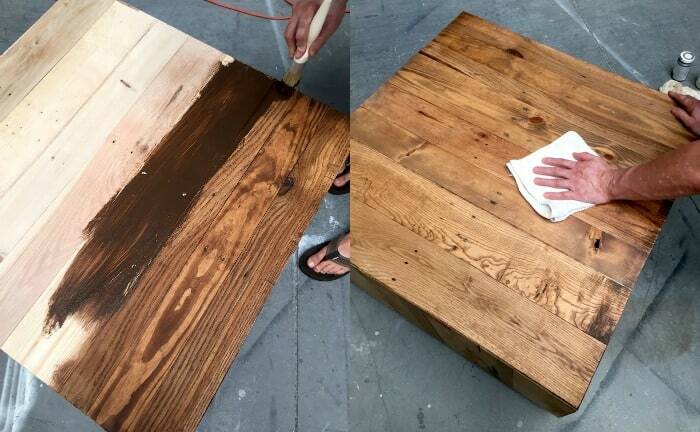 You can scale our DIY coffee table to any size, and stain it with any color. I’d love to hear what you think in the comments! This is insane. just gorgeous! Ah-maze-balls!!! Your table looks as good if not better than the uber-expensive version from West Elm! This table turned out great! You did an amazing job! wow amy this is stunning!!! pinned for an upcoming roundup!! =) thanks for the link as well!! Amy!!! This is fantastic. Pinning! Wow- this is too awesome! i’m going on a hunt for pallets now! thanks for sharing! Job well done , looks great. I would like to build this with barn wood. James I think that would look beautiful! This is AMAAAAAZING!!! FANTASTIC JOB!!! Excellent job…Excellent directions and Pictures!!!!!!!!!! The coffee table turned out beautifully! I want one now!! At first glance, I wondered if the inside was hollow, so it could be used for blanket storage or something. I’ve been staring at the tutorial to try and see if there’s a way to make the top removable, while still keeping the same look. Brilliant, brilliant craft. Good job, can`t believe it was 20 times cheaper ! LOVE your table. This is really one of the best DIY’s I’ve seen in some time and I even think your table is better than the one from West Elm! Will you make me one for a price??? Amazing! Very nice! This is one we’re definitely building soon, thanks for sharing. What would be a good substitute for the wood if I don’t want to use pallet wood? Love this table, but I live in continental Europe, where translating your supplies can be quite challenging. Is it 4 inches x 4 inches or 4 feet x 4 feet? Is it 2 inches x 2 inches x 8 inches ??? and (4) means 4 pieces? It explains ahead that I need 12 pieces. Hi there! 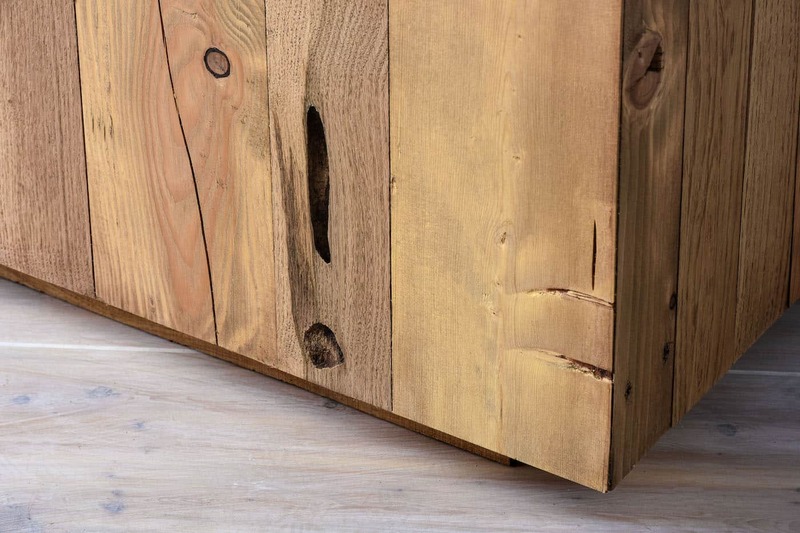 The 4′ x 4′ piece of pine plywood is a 1.2192 meter square piece of plywood cut to .762 meters square. The ‘ in our measurement system is feet while the ” is inches. If it’s going to be outside, use treated lumber like cedar – and then you could sand it smooth (if you want to). It’s also fine to keep it rough. Use a waterproof sealer or a deck stain. Pine will disintegrate in the weather. Cedar is a little bit more expensive but then you won’t be upset because your table won’t ruin. I wonder if it is possible if it can be made with the removable top so you can also use it as storage?